Taiko virtuoso Kenny Endo and his Contemporary Ensemble bring their 40th Anniversary Tour to the Aratani Theatre, 244 S. San Pedro St., in Little Tokyo, on Saturday, March 5, at 7 p.m.
Endo brings to the audience the mind-expanding rhythms and melodies culminating 40 years of study, practice, creativity and teaching. His uncompromising love of taiko provides the foundation for a musical vision that combines Japanese and Western sounds and rhythms. Internationally respected for his collaboration with other musicians, Endo combines a vast array of traditional Japanese drums with the sounds of vibes, drum set, ukulele, classical Japanese flute, and koto. Endo has invited master artists for this milestone event, including Kaoru Watanabe (fue and taiko), Abe Lagrimas, Jr. (vibraphone, ukulele, drums) and Derek Nakamoto (keyboards). 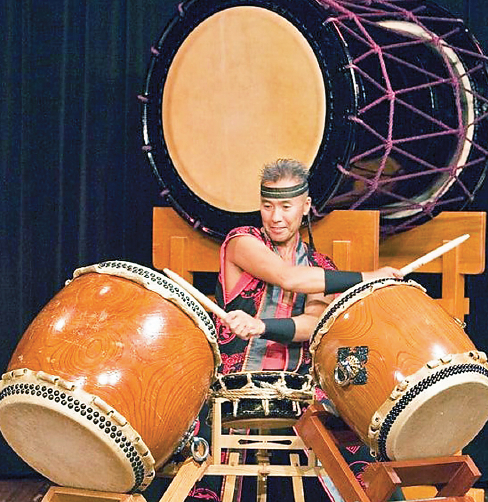 With four decades of performing, composing and teaching, Endo is recognized as a world leader in the taiko movement. Born in Los Angeles and based in Hawaii, he trained as a jazz musician and played in L.A.’s legendary Kinnara Taiko and the San Francisco Taiko Dojo. He has the honor of being the first non-Japanese national to have received a natori (stage name and master’s degree) in hogaku hayashi (classical drumming). For tickets and information, visit www.festivalofsacredmusic.org or call the Aratani Theatre at (213) 680-3700.